I am looking to smoke some meat for my chili, but the problem is, I have no smoker. I understand there are products like liquid smoke, however, this didn't create the taste I wanted or really much of one for that matter (I used a good 1/4 of the bottle too). Is there a way to get your own wood chips and smoke something in a propane grill or even an outdoor firepit? Are there wood solutions or chips you can throw into a crock for chili to provide a smoked flavor? Any help would be appreciated! EDIT: Found a link that mentions the possibility of using real wood chips in a crockpot to smoke the meat. I am a little skeptical of this. Would this be a possible method? I have successfully smoked with apple wood chunks wrapped in foil in my outdoor grill. The trick is to find a setting that will maintain ~300 F using 1/2 of the burners. Then place the foil-wrapped chunks on the hot side and the meat on the cool side. The wood will begin to smoke after 10 minutes or so. Keep checking periodically to maintain 300 F.
I do this with already cooked sous-vide pork. It may need adjustment to cook raw meat while smoking - maybe up the temp to 350 F or so. If you've got yourself a kettle grill or smoker, then you can enhance your sous vide brisket through a bit of honest-to-goodness smoking. I find that by letting my brisket cool a bit (or even refrigerating it for up to a week), I can place it on the cooler side of a kettle grill that I've heated to around 300°F with charcoal and wood chunks and let it smoke for a good three hours or so before it starts to dry out at all. This is ample time to develop a deep, dark crust and to get some smoky flavor in there. Is it better to apply that smoke before or after cooking sous vide? Well, according to folks like Meathead Goldwyn, author of the eponymous book on the science of barbecue, the flavorful compounds in smoke will adhere to and penetrate raw meat much better than they will with cooked meat. This is true, but I find that the amount of smoke flavor I get out of a post–sous vide session in the smoker is plenty for my taste buds, and smoking at the end makes the process so much more efficient. I'll stick to the post–sous vide smoke. I see chefs using "smoking guns" on food network competitions all the time. It's a tiny "gun" with a heating element. When a small amount of wood is placed in it and it is turned on, the smoke will exit a tube at the end. 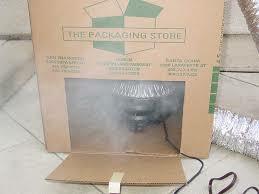 If food is placed in a plastic bag and twist tied around the tube the smoke can cold-smoke the food. Take a large cardboard box. Lay it so the top is facing a side. Cut a small whole to allow for a plug. Place a electric 5th burner inside. Use a super cheap pan as your wood pan. Put a rack on some rocks to lift it up. Place food on rack. Heat on medium. Tape box closed. You can find videos on YouTube. I would use smoked salt. Since I saw this video Justin Wilson Oysters and Crabs I'm using it. And man this is the thing. I was using different "smoked sauces", the thing with smoking the meat in an oven with some wood (similar to the method in your link), liquid smoke. Nothing can beat the salt trick. It's cheap, easy, you don't add additional taste (it's not salty from this salt) and you can use it to enrich the sauce if you make one from the meat. So you mix it with meat the put in the chili and if you think it could be more "smoky" you can add a little bit more. Something that is hard to do with other methods. 1 heavy wok. Good tight lid. Cast iron is best. 1 round rack in bottom. Heat wok till it smokes. 1 bags tea used then dried well. Drop in tea. turn of high heat. Put duck or chicken on rack. Put on tight lid. Wait till wok cools. 1 tea smoked duck or chicken. Now bake or fix bird. This is best done outside. 1 roasting pan. 1 rack in it. 1 tinfoil pack of charcoal or sawdust. Put in bottom of roasting pan. with 2 tooth pick holes in it. For smoke to escape. Place meat on rack. cover tight with 2 layers tinfoil. Place in hot over 360f or 375. Place on lower rack in oven. Let bake 1 & 1/2 hour. By then sawdust should have smoked off in pan. Remove from oven. Remove tinfoil. Finish baking roast at 325 or 350f. This will smoke up a oven inside. Hard to remove stains inside. But wok smoking is very easy if you have a outside burner. This will smoke up a kitchen. So quick wok smoking. takes a little practice to know how well smoked & time to smoke in wok. Do not remove lid! till cooled. That lets smoke out. There are several ways to smoke your meat without a dedicated smoker. Buy a wood chips box. This is a cast iron box, where you place on top of your ordinary grill, and place smoking chips inside. Some electric turkey roasters have integrated smoking chip compartments. I once owned one by Oster. Use a charcoal grill. Setting up the coals in a snake formation, can effectively smoke delicious meat. If used in moderation, liquid smoke can do the job when none of these other methods are available. Not the answer you're looking for? Browse other questions tagged smoking crockpot chili smoke-flavor or ask your own question. How can I cold smoke without any of the equipment?